Baby Mama: My Honey Badgers! 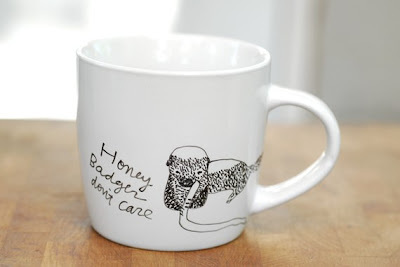 When Mo and Diz came to visit we made an executive decision to rename ourselves the Honey Badgers. Before you watch this video, make sure you have nothing to do for the next 20 minutes. I guarantee you'll want to watch it over and over again! In celebration of our new name, I think these will be a perfect addition to our kitchen collections! The narration on this video is hilarious! I'm not sure about being a honey badger, but I sure don't want to be a cobra!